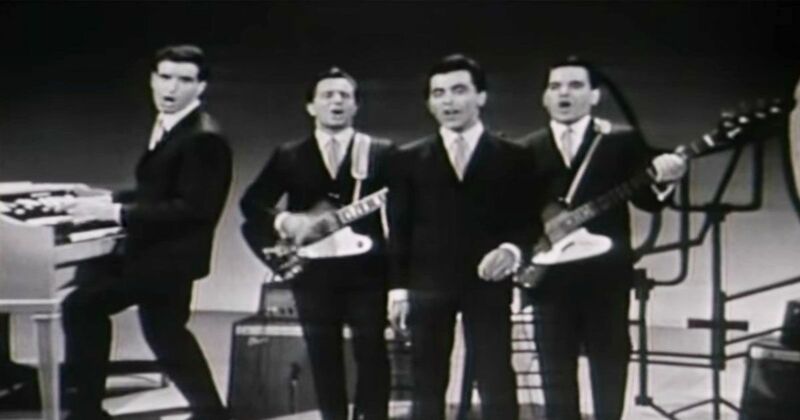 The Four Seasons were a major singing group in the early days of rock and roll, first hitting number one on the pop music charts in 1962 with "Sherry." The song was written specifically to feature the vocal range of their front man, Frankie Valli, with notes running from the baritone to falsetto range. The group was the first to put falsetto in the melody, and it became their signature sound. Eventually becoming known as "Frankie Valli and the Four Seasons," the group had a string of hits throughout the '60s and '70s. Valli hit number one as a solo artist with the title song of the 1978 movie "Grease," written by Barry Gibb of the Bee Gees. The Four Seasons were inducted into the Rock and Roll Hall of Fame in 1990, a member of the Hall's fifth class of inductees. The Four Seasons are a cultural icon, both for rock and roll music and for being from New Jersey. HBO's critically acclaimed series "The Sopranos," was set in New Jersey and often featured Four Seasons music, in addition to various scenes making mention of Valli. The Broadway musical and 2014 film titled "Jersey Boys" chronicles the four men's rise to fame from "the wrong side of the tracks in New Jersey" to become the Four Seasons. John Lloyd Young portrayed Valli in the film. Valli is very active in the entertainment industry; he appeared on "The Sopranos," as mobster Rusty Millio, and released the album "Romancing the 60s" in 2007. Valli still performs live shows regularly, with dates currently booked through November 2016. The video below shows the Four Seasons on an American television show in the early 1960s, singing a medley of their hits from 1962 to 1964: "Sherry," "Walk Like a Man," "Big Girls Don't Cry," "Dawn (Go Away)," and "Rag Doll."